An array is a collection of variables in the same datatype. we can’t group different data types in the array. Like, a combination of integer and char, char and float etc. Hence array is called as the homogeneous data type. Using index value, we can directly access the desired element in the array. 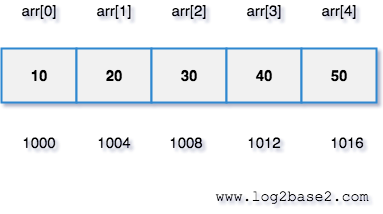 Array index starts from 0, not 1. In general, an array of size N will have elements from index 0 to N-1. Using the index value, we can access the array elements in constant time. So the time complexity is O(1) for accessing an element in the array.